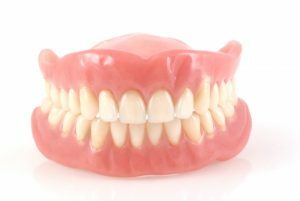 What are the benefits of dentures… good dentures, not ill fitting, ugly dentures. I’m talking about beautiful functional dentures that allow you to eat anything you want and look like real teeth! Dentures…they have an oddly unpopular reputation, and yet they are a remarkable solution to a long list of dental problems. Dr. Norkiewicz of Rockville Dental Arts in Rockville, MD encourage all of our patients to consider the many benefits of dentures, including the advantages and disadvantages of wearing dentures and get in touch to discuss them as a possible solution to your needs. As your dentist in Rockville, MD, we offer restorative dentistry. This is a comprehensive area of dental care that ensures our patients’ teeth and gums are in top condition and as functional as possible. When you are missing one or more teeth, it does mean that the mouth has experienced a reduction in its overall functionality. You may start to chew or speak differently, and this can harm the remaining teeth. If you have ignored your teeth for years and are missing teeth and have bad teeth and gums then Rockville Dental Arts is the place for you. We see patients just like you every day and we treat them successfully with dental implants and/or dentures. One of the many benefits of having dentures is being able to remove your teeth to clean them properly. They also allow your gums to heal at night when you do not have the dentures in. There are health benefits to dentures as well. No bacteria can enter the blood stream thru the teeth and gums. If you are looking for affordable dentures and want permanent dentures then contact us for a free consultation with one of our experienced dentists in Rockville Maryland. We offer partial dentures and full dentures as well as modern dentures that are fixed in place by dental implants. What all of that means is simple – whether you are missing an entire set of teeth or just one or two, implant retained dentures could be the ideal answer. Most of our patients choose to add dental implants to support their dentures and prevent them from moving around in their mouth or worse falling out. With an average ten-year life span, dentures offer an affordable solution to the issue of missing teeth. Though new dentures may mean you need a new set sooner, since gums and jawbone actually shrink as time passes, it is still a very financially savvy way to address missing teeth. Our new dentures look like real teeth! The cost of dentures can vary depending on the number of missing teeth and the type of dentures. There are many different types of dentures. There are conventional full plates, snap on dentures, partials, acyrlic types, cast metal ones, flippers, and more. Basically the cost could be anywhere from $300 to several thousand dollars depending on what will work best in your particular mouth. That’s why we offer free consultations! When you visit us you will get a free examination, usually a free xray and an exact price for your false teeth. When you have missing teeth, it can inhibit your desire to smile. You may become self-conscious about the appearance of your mouth, and this can have negative consequences. Not smiling may start to come far more naturally than smiling and, clearly, one of the benefits of dentures is that you start to smile again. You can also look, speak, and eat like normal with dentures, guaranteeing the best quality of life possible. If you have additional questions about the many benefits of dentures, or about any of the other treatments, including dental implant dentures or denture care, mentioned here, give us a call to set up a free consultation at our Rockville, MD denture office at (301) 424-2030. You can also use our online contact form and one of our staff will get back to you promptly.